The Government of Belize regrets to learn of the passing of Sir Elihu Lauterpacht, CBE, QC, July 13th, 1926 to February 8th, 2017. Sir Eli, as he was affectionately called, was educated at Trinity College, Cambridge University where he earned First Class Law and the Masters in International Law First Class and a doctorate in laws. He was called to the Bar at Gray’s Inn in 1950. 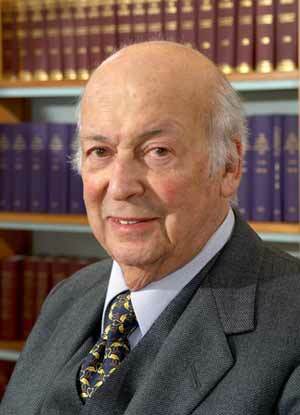 Sir Elihu has had a distinguished career both as a professor and practitioner of International Law. He became a Law Fellow at Trinity College at Cambridge University and first appeared before the International Court of Justice (ICJ) in the Nottebohm case in 1951. Since then he served as lead Counsel for several countries before the ICJ. In 2004, he was Counsel for Barbados before the arbitration tribunal that settled its maritime border dispute with Trinidad and Tobago. He also served as an arbitrator in several international Tribunals and as an advisor to some thirty governments over his long career. In addition to this significant study and providing invaluable advice to the Government of Belize on the Guatemalan claim over a quarter century, Sir Elihu last year donated his “Belize Archives” to the Belize Archives and Records Service. This is a collection of records that he collected over many years from the leading archives around the world. The material is to be used exclusively by Belize’s diplomats and lawyers directly engaged in the efforts to seek a final resolution of Guatemala’s claim, particularly if the matter is submitted to the International Court of Justice. Sir Elihu passed away on February 8th, 2017 in Cambridge, United Kingdom. In recognition of Sir Elihu's decades-long unwavering commitment to ensuring that Belize maintains her sovereignty and territorial integrity, the National Honours and Awards Committee, last September officially bestowed on him the Order of Belize.